AREGBESOLA MUST LEARN FROM PETER OBI OR WILLIE OBIANO. I read a note authored by Abimbola Daniya. The work titled “Aregbesola: moving Osun from mediaeval dependency to modernity”, published by The Nation Newspapers was brought to my notice by Semiu Okanlawon, Director, Bureau of Communications to the government of Osun State. Semiu doubles as spokesperson of the state government led by Ustaz Rauf Aregbesola. Abimbola Daniya deserves commendation for the resources he spent researching on the matter he selected to write on; in fact, his language, choice of words and points raised indicate he is a professional probably in banking and finance or an individual who has sound knowledge of the workings of government. Such show of intelligence backed with relevant fact impress me. It assures me that after everything, we still have amongst us people writers (or non-writers) who stick to facts and strive to give their opinion on matters of national importance on the basis of facts and nothing else. Abimbola’s document focused mainly on the financial position of Osun state under Ustaz Aregbesola. In the entire piece, he matched dates with figures derived from reputable sources and also succeeded in exonerating the governor from any act of fiscal irresponsibility. I am not surprised the writer attempted to justify the quest of the Ustaz to re-create an Osun that may possibly rival Ibadan and Enugu in 2 years but I must raise exceptions on two (2) items in the entire document he wrote and caused to be published. 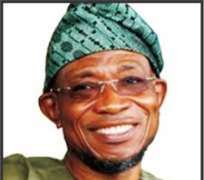 While I shall not bother to bore readers with what my full reaction to this statement should ordinarily be, in a simple statement, I will explain it to the extent of letting Nigerians know that a popular assumption held by members of the public have been justified by a sympathizer of Ustaz Rauf Aregbesola. Perhaps, Abimbola would need to be educated on the implications of this admittance. To start with, the August 2015 governorship elections in Osun state was a straight battle between the People’s Democratic Party and the All Progressives’ Congress. That alone should have made it easier for any serious contender to know from what point to attack his/her rival. It is therefore unimaginable that the All Progressives’ Congress then in the opposition at the federal level would seek to match the People’s Democratic Party in terms of finance. I am beginning to wonder why Ustaz Aregbesola would allow himself to be lured into a fight for the people of Osun State in a manner that will leave the said people unbelievably impoverished. This is one way how not to be a true democrat. The People’s Democratic Party is not the worse political party to belong to. Success stories abound about how the party has transformed lives of Nigerians in states where they lead. If nowhere else, Akwa Ibom, Delta, Enugu, Gombe, (even) Rivers and Ekiti are huge testimonies of the contributions of the People’s Democratic Party to the development of Nigeria through good governance. On the other hand, a peep into parts of Edo, Lagos (mainland & outskirts), Oyo and Zamfara will give a real idea of how perfect the APC is in delivering good governance. What then was Rauf Aregbesola fighting for when he (tried to) raise (d) funds that would better position him to confront the People’s Democratic Party which “pumped some N15billion into the elections, giving free Kerosene, Rice and cash for votes?” Definitely not Osun people! Abimbola have clearly not been to Anambra State. I doubt if he has seen a documentary on it recently. If he had, he would not have held his last opinion on my home state. Before 2005, besides just a few roads which were either rebuilt or expanded, my home state didn’t have a sign that indicates a responsible government was in place. Barr. Chinwoke C. Mbadinuju may have done his best but his achievements amounted to nothing because he spent most of his productive time strategizing to outdo persons who sponsored his emergence as governor. In 2003 after his exit, Dr. Chris N. Ngige and his sponsors started another round of battle royale which eventually cost him his position via a verdict handed by an appeal court which nullified his election. The interests of my people did not matter which these battles lasted. It is therefore safe to conclude that it was a deeply broken and plundered Anambra State that Dr. Peter Obi inherited. As an indigene of Anambra State, I consider my state blessed to have had Dr. Obi as governor at the time when over everything else, we needed a visionary leader with a sense of direction. That Dr. Obi spotted and supported his successor Dr. Willie Obiano to emerge governor is testimony to his commitment of building of a better Anambra. As I write, Dr. Obiano has not derailed in the business of governance. Shrewd bankers and finance experts, Dr. Obi and his successor Dr. Willie Obiano appear to have something in common despite their differences in politics. They seem to understand that like global banking giant – Guaranty Trust Bank, Anambra State is in a class of its own and is therefore not in a hurry to impress any institution by participating in a fake competition with imaginary competitors – the kind Abimbola says Ustaz Aregbesola embarked upon that have caused Osun State to be reference point when fiscal malfeasance is topic. Other than embark of the kind of “industrial and infrastructural revolution” Ustaz Aregbesola embarked on, these gentlemen deployed their deep knowledge of financial and economic planning to chart a steady course for the development of Anambra State on all fronts which have caused my state to be among the comity of less than 5 states in the Federal Republic of Nigeria that are fiscally viable by all ramifications. It is not the core responsibility of astute leaders to perform in office but they owe citizens an obligation to make them (citizens) perform for the good of the state. This has played out in the volume of new businesses that the Obi and Obiano administrations caused to grow in my state between 2005 and today. The effect of this is that we no longer have a bloated civil service which is a core characteristic of Osun State. Our wage bill have not sky rocketed. Our civil servants have been encouraged to take a bow from salaried employment to self reliance via medium scale enterprises which have in turn boosted the economy of my state. As I write, recurrent expenditure is firmly under firm control and funds which should ordinarily be spent paying salaries and pensions is being effectively utilized in our education, works and health sectors to the benefit of the state. Small scale business have been globally proven to be the engine room of every economy; lessons are in abundance to be learnt from the Asian tigers; I wonder why some governors will not look toward them or at least Anambra State for guidance. Any government that ignores this essential industry is sitting on a Keg of gun powder and bail out of any sort will only cause temporal relief. Governors of states which are broke should seriously consider job cuts and reduced spending on all payments. Crazy as this seems, it is the only way out and the only solution that will cater for the surge the unemployment market will experience can be best learned from either Dr. Peter Obi and/or Dr. Willie Obiano.